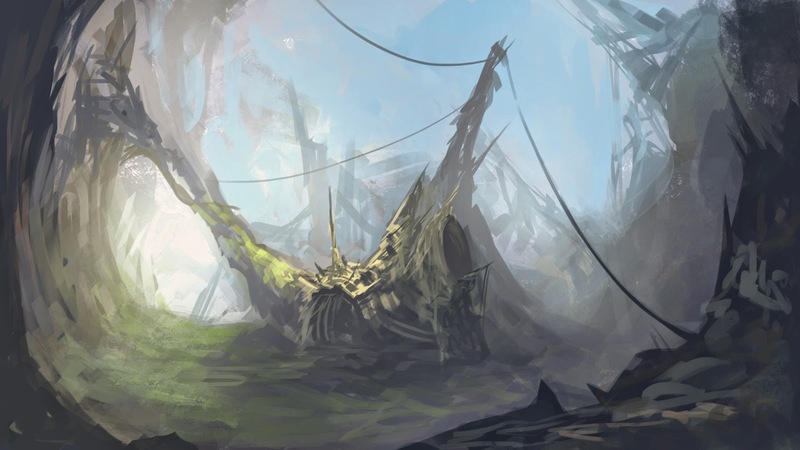 There was some recent controversy towards the 'Daily Spitpaint' group on Facebook. The admins were supposedly enforcing rules hard, banning people instantly who claimed to have gone a little over the time limit. There was also a post saying that photo stamp-like brushes (Tree stamps for example) were now also banned. For this reason, concept artist 'Espen Olsen Sætervik' created a more relaxed group. 'Super Speedpaint Funtimes' allows a 50 min time limit, allowing phototextures and any brushes. I don't think that this new group has the intention of sabotaging Spitpaint (which I am not adverse to still using despite its strict rules), but I think Espen has created something that more tailors concept artists, where we can work in our comfort zone, applying phototextures and a fast workflow as we please. I like this new groups approach. It has yet to loose touch with the idea that art is about having fun and being creative. As long is it doesn't plagiarise, we just be free to use any media to express ourselves. I chose to begin with this topic as it fell with out my distopian future Sci-fi comfort zone. I didn't use photo textures or reference in fact for this piece, as I was acting on impulse and being expressive. I will likely try more topics, but treating them like mini-briefs. I will gather reference and try and create an efficient workflow using phototexures and appropriate texture brushes.